TRIP INCLUDES: Services of our talented adventure consultants and professional guides,” all meals/beverages as indicated in the itinerary , all rafting/camping gear, transportation to/from river. This is the most approachable section of the Owyhee as the rapids are easy to moderate in nature and we are able to use our larger 16' rafts and run more of a "normal" rafting trip with the usual amenities that make for very comfortable and cushy camping. Our put-in is near the town of Rome with our take-out being at Birch Creek. During the trip we visit several wonderful hot springs where we try to spend a night or two. Camps are set on sand beaches. We see some dramatic geologic formations along the way, some of which are similar to the Dakota badlands. There are plenty of hiking possibilities and plenty of camp time for relaxing, photography, and bird watching. The best choice for those who don't want the tough whitewater of the Middle Section, or the expedition-quality of the Upper sections. Trips are limited to 16 guests and four guides. 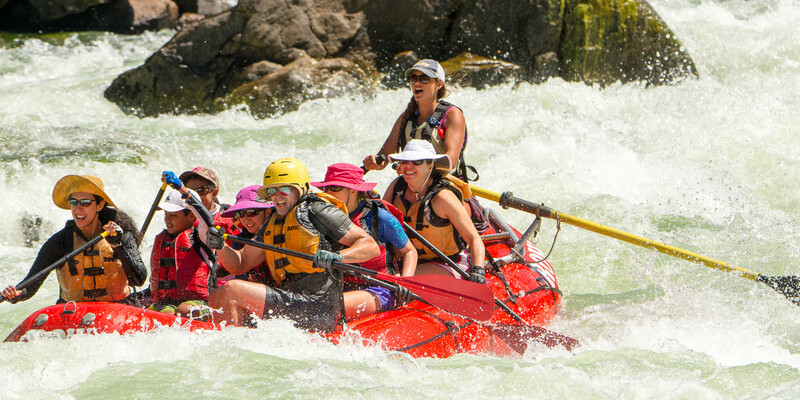 Best-suited for very experienced rafters due to the remoteness and severity of the whitewater, we use extra caution and conservative judgement in running the rapids. Our put-in is at the Three Forks launch site with our take-out near Rome. During the trip we stop to scout several of the rapids, and line our rafts at the Widow Maker - a process requiring 3-5 hours, depending on how many rafts we have. This section ﬂows through red-rock canyons with huge monolithic pillars of rock. There are a number of graceful, twisted juniper trees along the river and many interesting hikes. The put-in is around 5000' elevation near the Duck Valley Indian Reservation and will vary with our take-out usually at the Three Forks launch site. Due to the numerous rapids and narrow, rocky courses, we use a small 13' raft to carry the community camp equipment, and each person or couple paddles their own inﬂatable kayak. There are at least two portages on this section and we travel light in order to minimize the delay and hard work these present. Due to the extreme remoteness and inaccessibility of the area, wildlife sightings are best on this part of the river. This canyon is as remote as anyplace on the North American continent. Meeting Time: All trips meet the evening before the launch date. For trips on the Upper Owyhee we meet in Boise, Idaho. Trips on the Middle or Lower Owyhee meet in Boise for those who ﬂy and Jordan Valley, Oregon for those driving. For Lower and Middle Owyhee River Trips your ROW team leader will meet you the evening before your trip either at the Boise airport at 5:00 PM Mountain Time (if you ﬂy) or at 7:30 PM Mountain Time at Jim’s Shell Motel in Jordan Valley, Idaho (if you drive). At the motel in Jordan Valley, we’ll have a brief meeting to answer your questions and give you your waterproof bags to pack. This is an important meeting, so please be on time. Early the next morning (usually about 7:30am) we leave in our van for the 30 minute drive to our put-in at Rome for Lower Owyhee trips, or for a one-hour drive to Three Forks for Middle Owyhee trips. At the end of the trips, we’ll drop off those who have cars in Jordan Valley at the motel around 4pm. You may want to spend the night or begin driving home. Then, those who met us in Boise will continue in our bus, arriving at the Red Lion Inn Boise Downtowner by about 6pm. For Upper Owyhee trips, we meet everyone in Boise at 7:30pm Mountain Time the evening before the trip at the Red Lion Inn Boise Downtowner. The next morning, we depart from Boise for our 5-hour drive to the put-in. At the end of the trip, we return to Boise by 6pm. For all Owyhee river trips, if you ﬂy to Boise, it’s best not to plan to ﬂy home that night, as we don’t know our exact arrival time (muddy roads can slow down our take-out) and you’ll be ready for rest and a hot shower. For Lower and Middle Owyhee trips, be sure you arrive in Boise no later than 4:45pm the day before the trip for our 5pm airport pickup. If you are driving, then drive to Jordan Valley where you can leave your car at the motel parking lot during the course of the trip. Some travel distances and directions: From the San Francisco area, head to Reno and Winnemucca and turn north on Highway 95. Allow 10 hours. From Portland and Seattle, ﬁrst go to Bend, Oregon, then head east on Highway 20 to Burns. Then Highway 78 for 90 miles to Rome, turn north on Highway 95 for 46 miles to Jordan Valley. Motel Accommodations: Middle and Lower Owyhee Trips - The night before your trip, we suggest you stay at Jim’s Shell Motel in Jordan Valley, Oregon. To make reservations just call them at 541-586-9244. Please Note the Jordan Valley Rodeo is always held the third weekend in May and typically ﬁlls all the hotels. For trips during this time we will meet in Boise, ID instead. For the night after the trip if you are driving, you may want to start your drive home, or stay in Jordan Valley again. For those that ﬂy to Boise, we'll take you back to Boise this evening and suggest you stay at the Red Lion Boise Downtowner, phone number 208-344-7691. Be sure to ask for the ROW Adventures rate. Upper Owyhee river trips - The night before and the night after the trip, stay at the Red Lion Hotel Boise Downtowner phone 208-344-7691. Be sure to ask for the ROW Adventures rate. They offer free airport pickup and are about 10 minutes from the airport. (Just call them using your cell phone as they do not have a courtesy phone in the airport.) You can also store extra luggage there during the trip or leave your car in their parking lot. Don't be surprised if the people at the front desk don't know anything about ROW, although our corporate rate is coded in their computer system. Their staff turns over regularly and we are very small part of their total business. Our Owyhee River Whitewater Rafting Trips generally run from April to late May, with the best water levels and weather in May. Since spring is a time when weather systems tend to be less stable than in the summer, temperature ranges can be extreme, with the possibility of snow flurries and a 95-degree sun in the same day. Our detailed packing list will tell you what you need to bring to be properly prepared. Because of the unpredictable weather and water levels, we ask that everyone who signs up for these trips be flexible and come prepared for all kinds of weather. Both high and low water can happen. In low water, we can usually run, but it might require running lighter rafts with fewer amenities. In May, on Owyhee River trips, we ask that you be willing to transfer to the Snake River in Hells Canyon should the need arise. Our goal is always to raft the Owyhee River and you can bet we'll do everything in our power to run the trip as scheduled. If we do have to change, it won't change your logistics any, since we will still meet and end in Boise. Fishing gear and Oregon fishing license if you plan to fish - must be in a protective case & disassembled. Only catch and release fishing with single barbless hooks is allowed!! IMPORTANT! It is important to keep your gear to no more than 25lbs! This is especially critical on the Middle Owyhee where linings or portages are possible and on the Upper Owyhee where everyone carries their own gear in their inflatable kayak. If you plan to fish, please bring your own fishing gear (with a protective case), as we do not have any to loan. A fishing license is required to fish. You can pre-purchase an Oregon license by visiting the https://odfw.huntfishoregon.com/login website. ROW packs moderate quantity of soft drinks as well as wine and beer for legal age guests. If you bring liquor, please give it to your guide in a labeled plastic container. Beer should be in cans - No glass beer bottles please. Bottled wine is fine. All liquors in Idaho and Oregon are sold in State Liquor Stores with limited hours. Please be aware we have limited space on our rafts therefore moderate quantities, please. If you are arriving after 7 pm BE SURE TO PURCHASE your liquor at home and bring it with you. What to do in Boise?